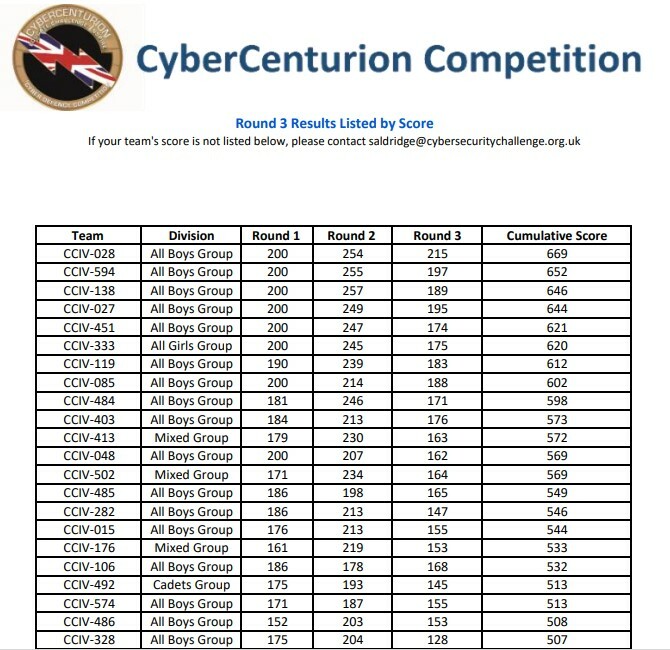 I’ve got to be honest, I haven’t been involved in the CyberCenturion IV competition as much as I was with the 3rd one. After watching the teams compete during the first competition round, during the second round the school closed early due to snow (I was involved with sending out all of the messages, and the students only had till 4PM rather then the full time of finishing at 6PM), and during the third round Sage set itself on fire by not allowing anyone to log in to it after performing an update (long story sort-of-short: Sage drive was set up a while ago as we were prompted to, and all users logged in to that with one account. It was meant to be set up with one Sage drive account per Sage account, but this didn’t stop it from working before. After waiting many hours for the support department to get back to us, they said it wasn’t needed as we were using Sage on-site and it was intended for remote users. They then removed it and everything was happy again. I’m now starting to dislike Sage as much as I do SIMS). However, the teams themselves just got on an worked hard at solving the problems that were in the images. 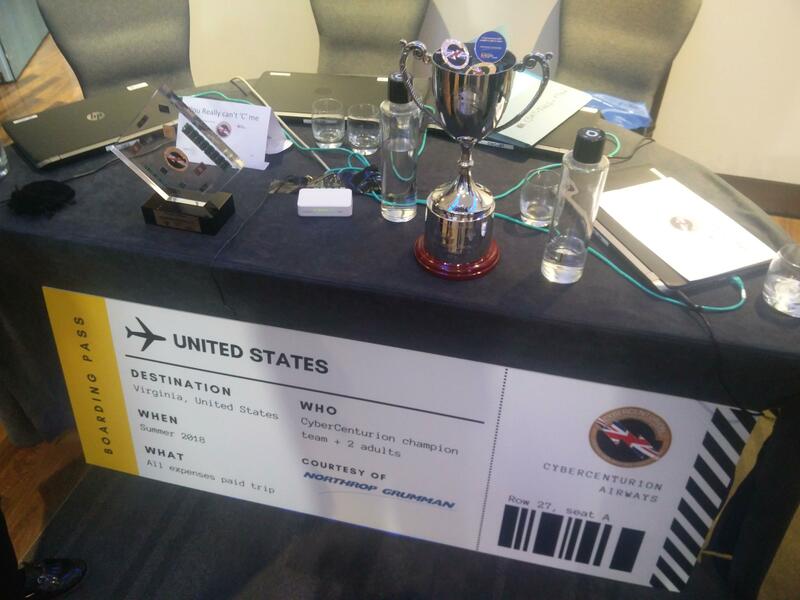 After all three rounds, we had managed to get one team (CCIV-028) through to the final. 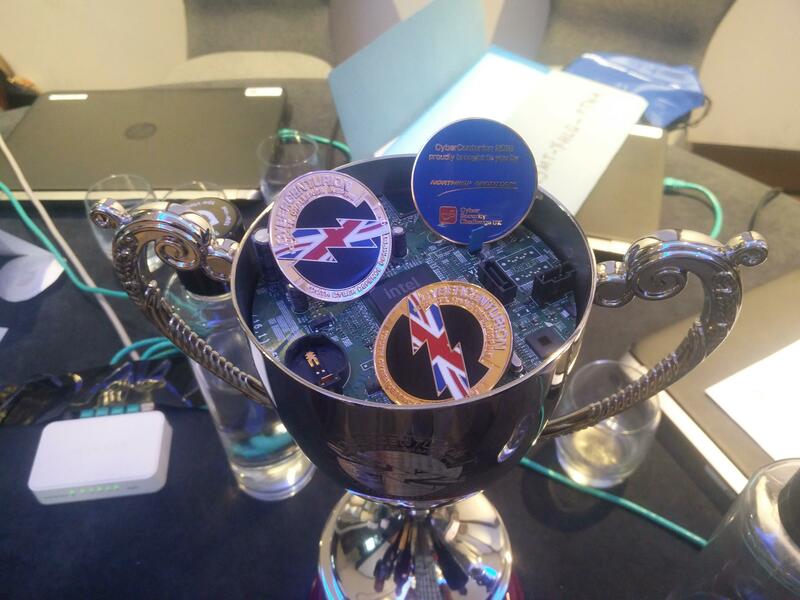 Better yet, that team was the top group in the UK competition, with a lead of nearly 20 points (as shown on the results table). The students in this group had all been in at least one final, while for other students this would be their third time in the national finals. 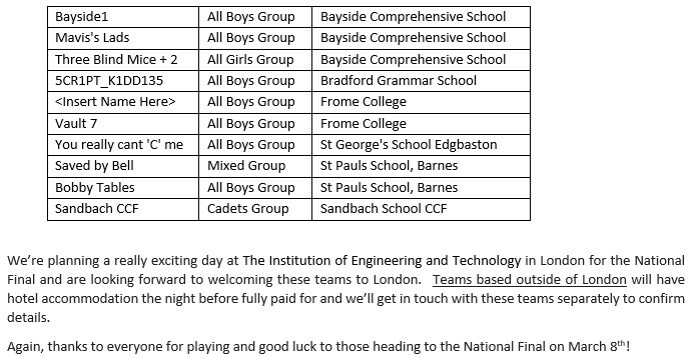 Around a month before the finals were to take place, an email was sent out to all teams with the names of the schools progressing into the finals. What was interesting with this email was the line “Teams based outside of London will have hotel accommodation the night before fully paid for and we’ll get in touch with these teams separately to confirm details“. Now, I’m not trying to say that this was due to us being, um… late, to last year’s final, but it possibly was. Still, it was a very nice gesture from the people running the competition, and it must’ve cost quite a bit as there would be a number of rooms needed for the various teams and staff members. The school had booked the 14:14 train from Birmingham New Street to London Euston. To make sure that we got there on time, the 5 team members and three staff members received a lift on the schools minibus (glamorous, I know) at 13:30. We arrived with plenty of time to spare, as we were on the platform when the train pulled in. This allowed us to sit in the highly prized seats (the ones with tables) and to put our bags in various locations. The train journey took about 2 hours. One of the students used their laptop to play around with some software they had found the night before, while the others made good use of their time by taking many photos of each other and sending them to a CyberCenturion group chat which consisted solely of themselves. Talk about being social!. 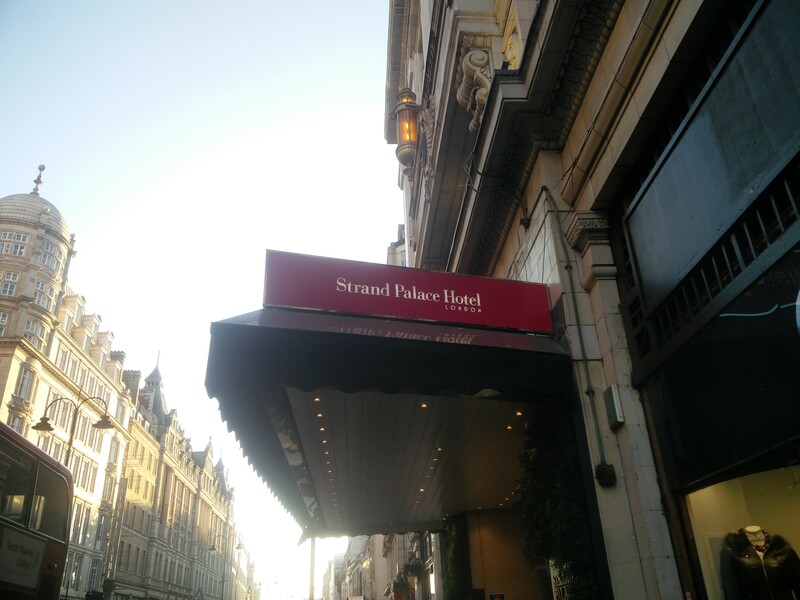 Upon arriving at London Euston, we had around a 30 minute walk to the hotel, which was the Strand Palace Hotel (I didn’t actually know the name of the hotel until this point). We did follow the pavements and not just walk straight through buildings. Honest. 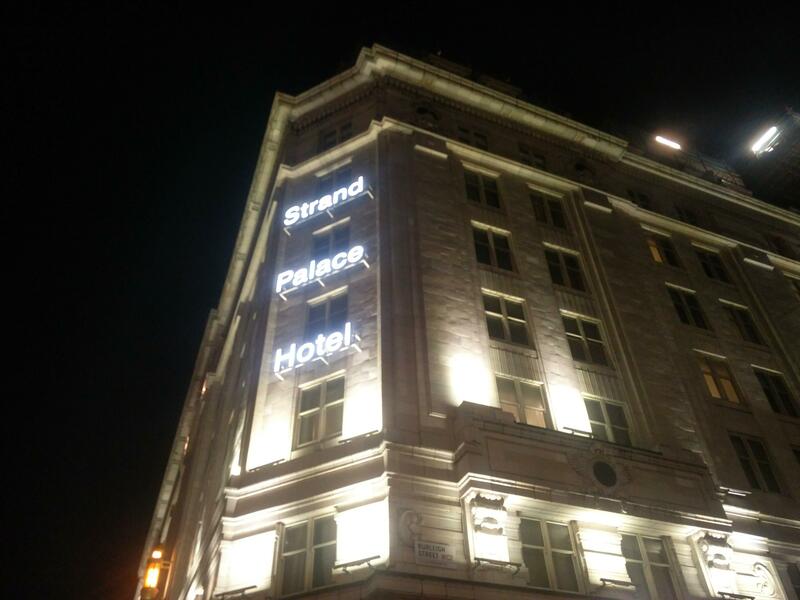 There was a doorman on the, well, door – that tells you you’re in a posh hotel straight away. The reception area was quite a large-ish open space, with a number of fish tanks. The teacher accompanying us on the trip went up to the reception desk to check everyone in, while we had a chance to see a few of the other teams also hanging around the lobby area (or, as is the case with our students, run a speed test on their phones to see how good the Internet would be). For some unknown reason, everyone was spread out over the hotel, rather than being in consecutive rooms. We went to one of the rooms to see how big it was, then sent off a few of the other students to find their rooms. 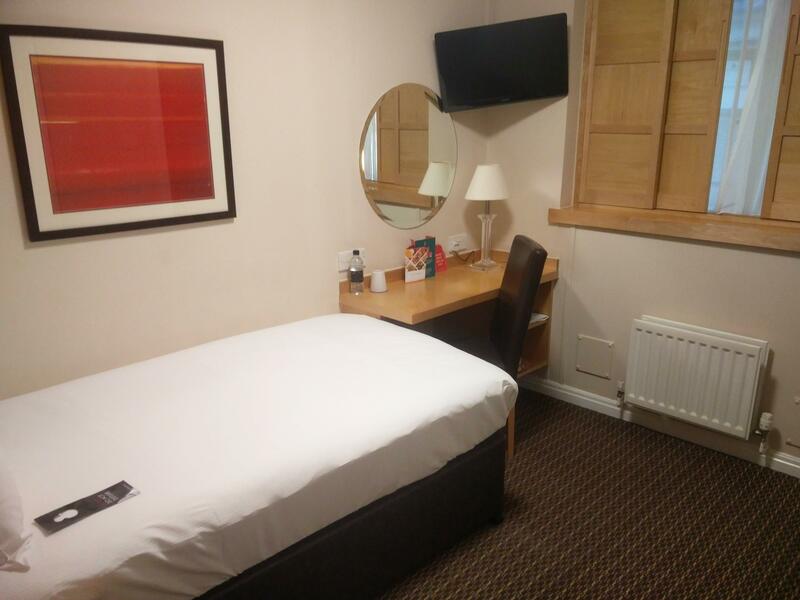 Around 10 minutes later the students finally turned up, saying that the layout of the hotel was confusing and there weren’t any signs to their room. While not entirely believing them, we (the staff members) then went off to find our rooms. 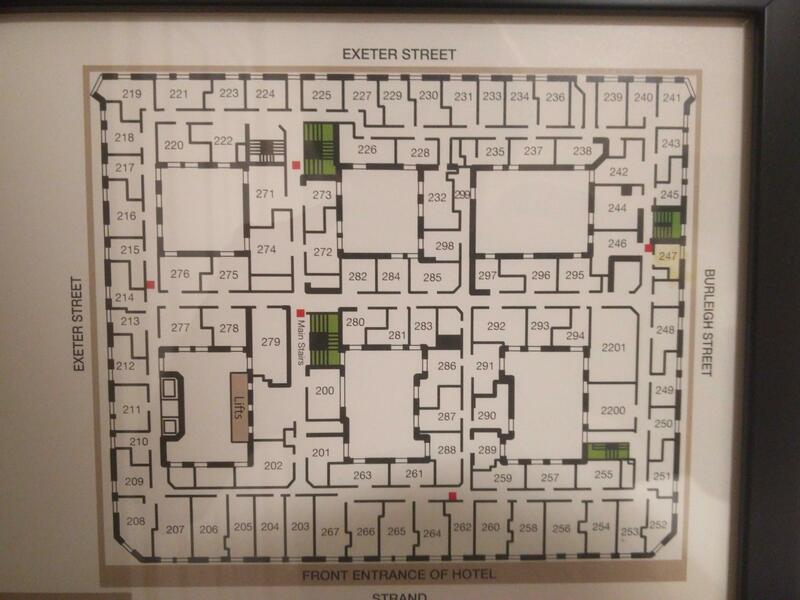 During this room finding expedition, we agreed with the students that the hotel was not very easy to navigate. However, we eventually found our respective rooms and got settled in. 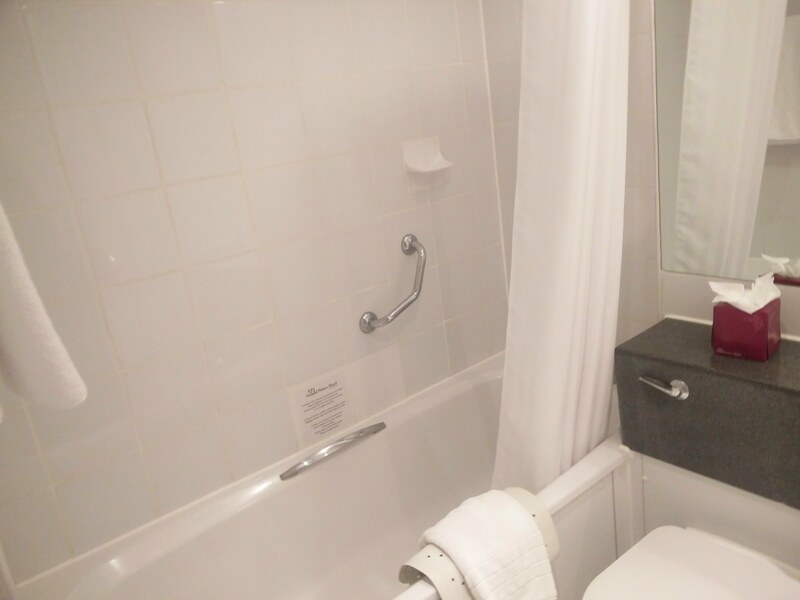 Who designs a hotel like this? It was now 6 o’clock (it was half five when everyone had found their rooms) and we were on the lookout for food. 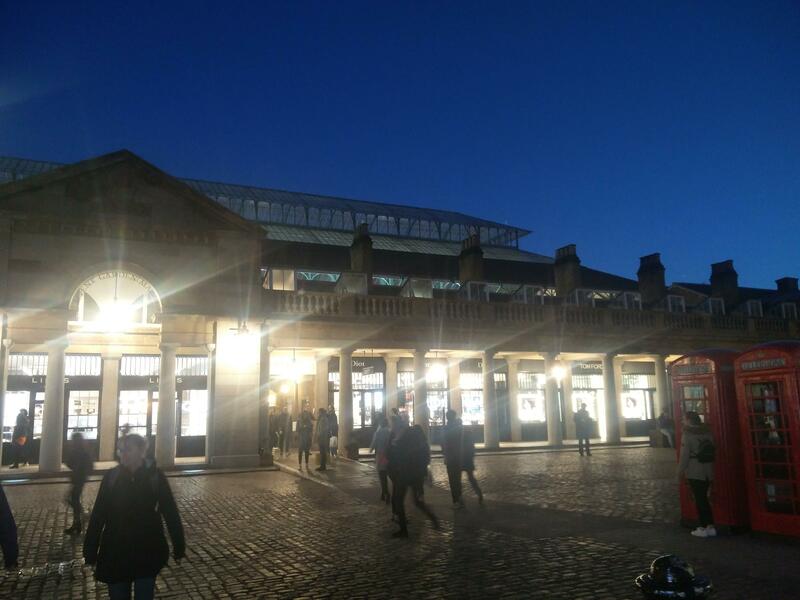 Covent Garden was just around the corner from the hotel, so we decided to go there to see what restaurants were around. 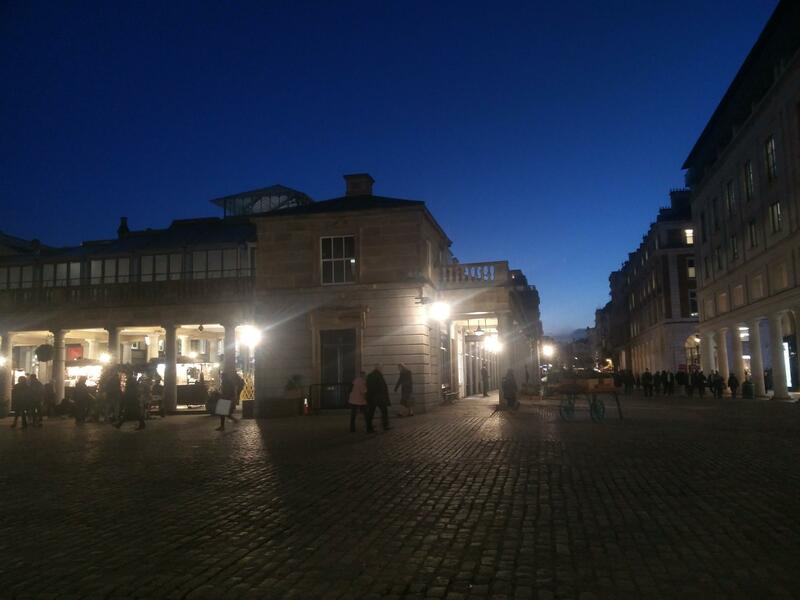 Apart from seeing a street performer singing opera and performing magic, and a number of photos being taken of the last bit of the sunset, we didn’t choose to go into any restaurants there. 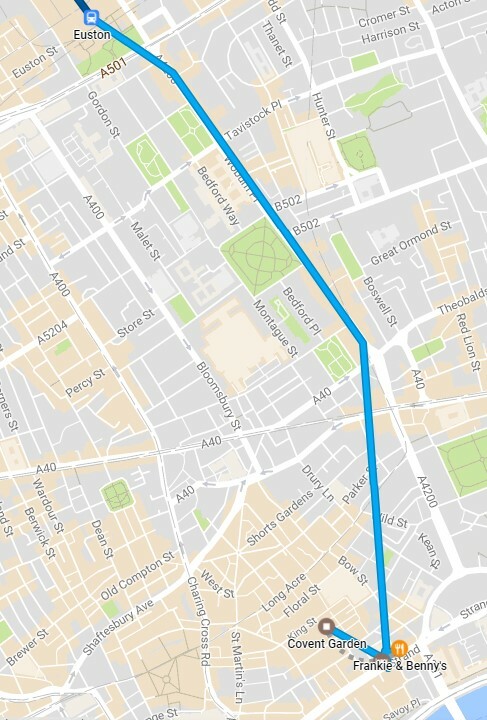 What we did end up doing was taking a circular route back to a Frankie and Benny’s restaurant that was immediately next to the hotel. While there were a number of other teams which had taken up the idea of having food (well, not the walking in a circular route part, but a “Hey, there’s a restaurant, let’s go there” type of idea) as the restaurant was full when we went in (from the other teams and rush-hour customers), we were certainly one of the last groups of people to leave. Our waitress had already gone home, and there were very few customers remaining. The school had kindly agreed to subsidise the meals for the staff, but the students had to pay for themselves. After starters, mains, sides and drinks the combined bill for the students totalled somewhere around £130. This was taken outside the restaurant. Yes, we were that close! I probably shouldn’t tell you this, but this is one of the rare times that I wasn’t being very smart. I’d turned the shower on and nothing came out. Then I turned the tap some more, still nothing. Turning it further resulted in a dribble coming from the head and landing in the bath. Finally I turned it even more and instantly soaked myself, the ceiling, the mirror, the toilet and the floor. I quickly turned off the tap, but in a moment of pure genius I turned the tap back on again, only for the exact same thing to happen. After drying the various parts of the bathroom (for the second time) I turned on the tap again, slowly, and noticed that the water was leaking out of the sides of the shower head rose, rather than the nozzles. My saving grace here is that the same thing happened to other people too. Four stars don’t get you everything it seems! At the meal the night before, it had been decided for everyone to meet up at half 7 for breakfast, as it gave everyone an hour to eat, followed by half an hour for final packing and walking to the IET building, where the competition was taking place. The restaurant was as oddly designed as the rest of the hotel, with it being divided into four large rooms. Breakfast was a combination of cooked and continental food and was tasty. The rooms were full with guests, and we also had the chance to see a few more of the teams who we were competing against. 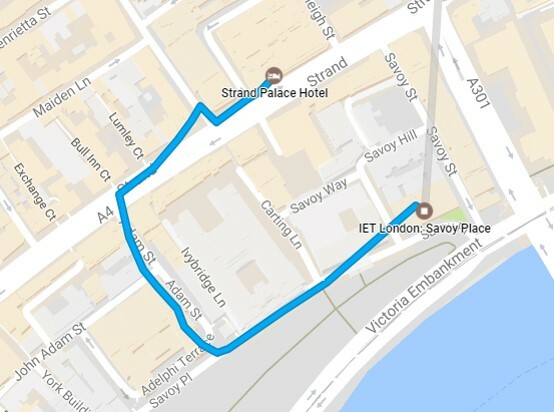 It was a 2 minute walk from the hotel to the IET. Well, 2 minutes if you go the correct route. It took us around 10 minutes. Luckily it was warm and sunny, and we got chance to walk past a part near the river Thames on our way there. We got to see both the front and back of the Savoy hotel. How many people get that privilege? Registration was open at 9 o’clock till 10, and despite staying in a hotel near the place we were still one of the last (if not the last) team to arrive. While the competition was taking place in the same building as last year’s competition, it was on a different floor. It was still the same length, but didn’t have a high ceiling. After putting our coats and bags in the cloakroom, we got to have a quick look around the room before being ushered into the “holding pen” room (a smaller room that was divided from the larger room). Around twenty to 10, some of the staff running the competition welcomed everyone and went through a few of the rules to remind everyone of the expectations. After that, all of the teams filtered through to the competition area to find their stations. Our team was at the opposite end to the “holding pen” room, and there was a stage in the middle. We also had a mascot, which was a rubber duck that one of the students uses for debugging when coding. A few other people came onto the stage to introduce themselves and to wish everyone the best of luck, and as the time neared 10 o’clock everyone who wasn’t taking part solving the issues in the images was asked to leave the room. A countdown then happened, and everyone started on the morning part of the competition. As you can see, the top three teams were close together, and had started to gain a lead over the other teams. It was at this point we hoped one of those was our team. Half an hour into the competition, there were now two teams battling it out, with the third place team close but slightly further behind. Around the 45 minute mark, the gap between the top teams was still close, but had spread apart a bit more. While it wasn’t possible to know which team was which, looking at the graph report that we were able to, it didn’t look like our team. Normally the Windows images have a very steep increase at the start, with the Ubuntu images taking a gentler slope. However, for whichever team this was, they were struggling quite a bit, and the Ubuntu image hadn’t really gained any points since the competition started (and at the point of the screenshot it was on minus 1 point!). 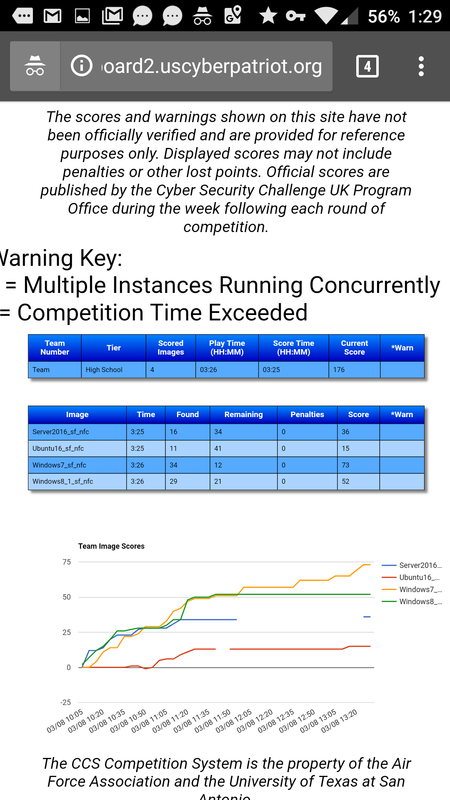 The staff members running the competition did say that they’d made the images very difficult, but if this graph was currently showing the best scoring team at the moment, then the images must’ve been incredibly difficult. There were around 50 issues on each image (Windows 7, Windows 8.1, Server 2016, Ubuntu 16). At quarter past 11, the team that had been at the top of the scoreboard since the start was pushed into second place thanks to a big jump by another team. However, both of these teams had opened up a very large lead over all of the other teams competiting. It was at this point that we started to reverse engineer how the scoreboard worked. We realised that the graph always related to the same team, rather than whatever team was at the top of the scoreboard as we originally had thought, as the total points gained matched on both pages. 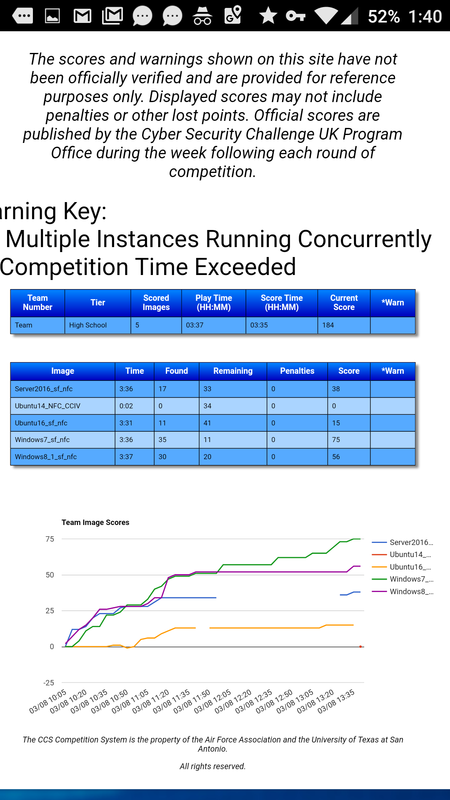 Therefore, the graph page must pull out the first record from the database from the list of teams competing, rather than sorting by the total scores and pulling out that team ID (well, when sitting in the “holding pen” you have to make up your own entertainment). This was useful to know, as it mean that we could identify at least one of the teams that were playing and see how they jumped around the scoreboard. 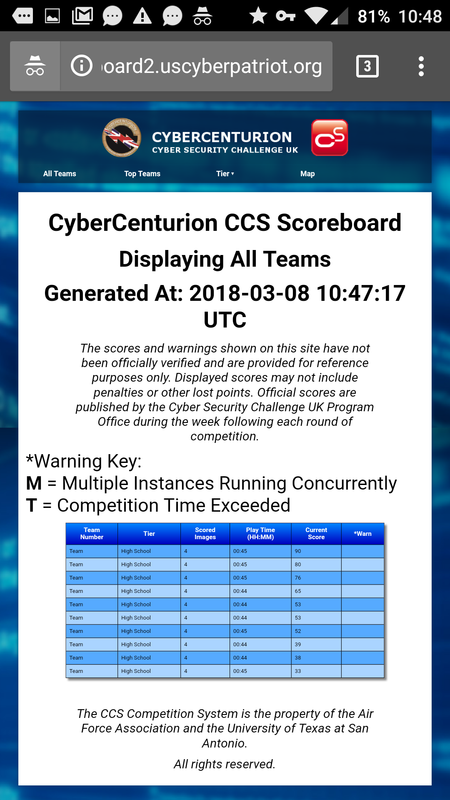 With half an hour of the morning part of the competition remaining, the top two teams were within a few point of each other, and a number of the other teams had also broken past the 100 points barrier. Around quarter to 12, the team that were currently in first place were opening up their lead, with the second place team seemingly stuck as they hadn’t gained many more points, and the teams in third and fourth place were closing the gap on second place. 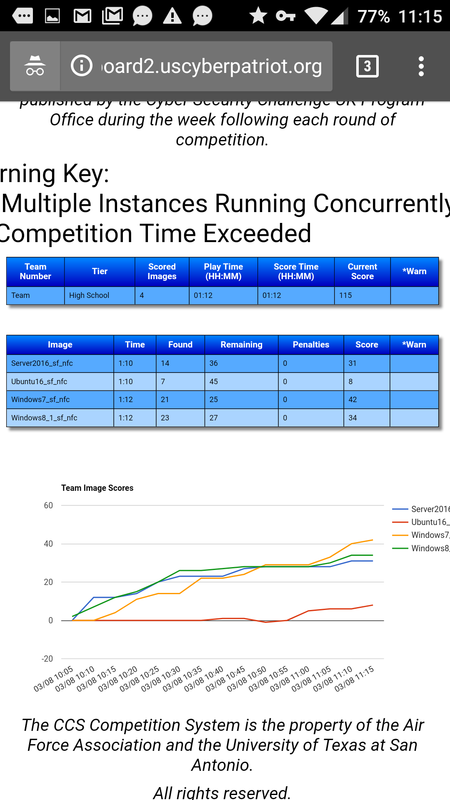 As the graph referred to the second place team, we were able to see that they had been able to gain a few more points on the Ubuntu image, but it was still a bit behind other other images. It also showed that one of the teams had opened multiple images, and we weren’t sure why they would’ve done that. The team in first position had strengthened their lead, second place had gained a few more points, and third place was now a joint position. We made our way over to our team, as did everyone else to their respective teams, to see how they were getting on. To sum it up, they were hating the images. Windows Server was set up as a domain controller so most of the settings weren’t were the students were used to (I’d always wondered if they would do this, but didn’t think they would. However, by pure luck, the student on this image has some experience with how Active Directory works as in the past he’s asked me many questions about how our school network is set up, and has dabbled with AD in virtual machines too), and the Ubuntu image had something making sure that almost nothing would run or install, with it spewing errors all over the place. The students on the Windows 7 and 8.1 images seemed happier as the issues were along the lines of what had been happening in the competition rounds. Lunch was a combination of sandwiches and snacks for the staff, with students getting similar but pre-prepared packed lunches. A majority of the rest of the lunch involved the students bringing the student who was to swapped in up to speed with was had already been done to avoid wasting time, and a talk from a guest speaker about the importance of Cyber Security. Well, that, and the students constantly moaning about how difficult the people running the competition had made the images. With a few minutes before the afternoon session of the competition was due to start, all non-competing students and staff were asked to leave the room so that the competition could start promptly. I did a few last motivational words to the students, which mainly consisted of “you were the best team for most of the morning, right before the other team jumped ahead of you. Keep up the hard work!“, then started to make my way back to the “holding pen”. Unfortunately, I’d mistimed how long it would take to walk back to the room, and so that I wouldn’t just be walking straight through the room as the competition restarted, I took a route through a corridor. However, this didn’t work too well as I ended up back in the main room, just slightly further down than when I went into the corridor. At this point I would have just decided to walk straight into the “holding pen” room from there, but the 10 second countdown had just started, and there was a cameraman pointing a camera at a team right next to the doorway. So, I did what any normal person would have done. I stood around awkwardly near the back of the room until he’d stopped filming. The lunch and swap of team members had helped, as a few minutes after starting points were gained on one of the images. However, by quarter past one there hadn’t been many points gained for the other images. Also, quite worryingly, the Server image wasn’t reporting it’s score back. We weren’t sure if the team were aware of this, but were hoping that there’d be a big jump that would help push us back up into first place. Around half 1 the scoreboard showed that Server was reporting it’s score again. Either the students had noticed it, or the technical staff had done something. Unfortunately it didn’t have a jump that we were hoping for – it had stayed flat. Looking on the overall scoreboard, our team had also slipped into third place, and were close to becoming fourth. On a more positive note, points had finally be gained for Ubuntu after a very long time, and the Windows 7 image was also gaining some points too. Ten minutes later the team managed to gain points in both Windows 8.1 and Server, which pushed them back into second place. It was at this time one of the technical staff came into the “holding pen” and announced to everyone if they would be able to just look at the scoring report on the large display screen in the room, rather than on their individual devices. It turned out that everyone hitting the web server was what was causing the page to not load sometimes on the large screen, and for the Server scoring points to not show up correctly too. At the start of the competition the teams were informed that they needed to nominate one team member to come up to the stage should there need to be any announcements or changes made during the running of the competition. Well, it turned out that this was now going to happen. The teams were informed that another image was to be included into the competition. Yes, that’s right, 5 images! In previous years there’s been three images to start off with, then increased to four later on (similar to what had just been announced). However, there were only four team members allowed to compete at once, and four laptops available. The teams had to make a choice – keep running the Ubuntu 16 image and try to gain more points on it, or swap to the new Ubuntu 14 image. We hoped that the student who was our Ubuntu “expert” (he’s only ever done Ubuntu as everyone else has shied away from it) would cut his losses on the difficult one and move onto this new image. Well, according to the scoring report graph, he did just that. Since we’d all been told off for refreshing to scoreboard too many times on our phones, I didn’t look too often. To be honest, at this point I was starting to find it a bit tense as the competition was in its last hour, so I didn’t want to see how well the team was doing. However, for the sake of recording the day, I decided to take a look at the scoreboard at 2 o’clock. 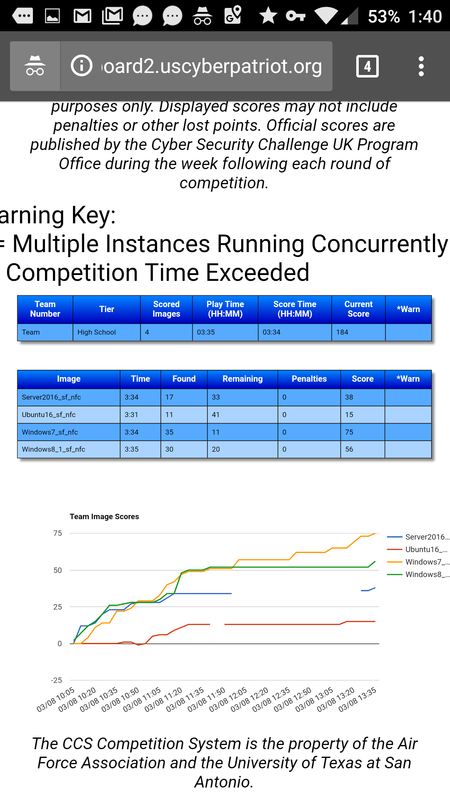 While our team was still in second place, behind by 20 points, the student on the Ubuntu image had set off like a rocket and was gaining points exceptionally fast. After 20 minutes of work he’d already gained more points with this new image that he did with two and a half hours with the previous image. By half two I decided to have a look at the scoreboard again. OK, that’s a bit of a lie, I caught a sneaky glimpse when I heard the other staff members from our school mention that our team was around 40 points behind the top team a few minutes before. However, when I took this screenshot that had managed to close that gap to 13 points behind the top team. Points had been gained recently on all of the images, and the student on the Ubuntu image had now managed to overtake the Server image for number of points gained. This was more like the graphs we were used to seeing! Similarly to how the scoreboard wasn’t on for the first 15 minutes of the competition, we were told that it would be turned off with 20 minutes remaining, to keep an air of mystery as to where the teams were. 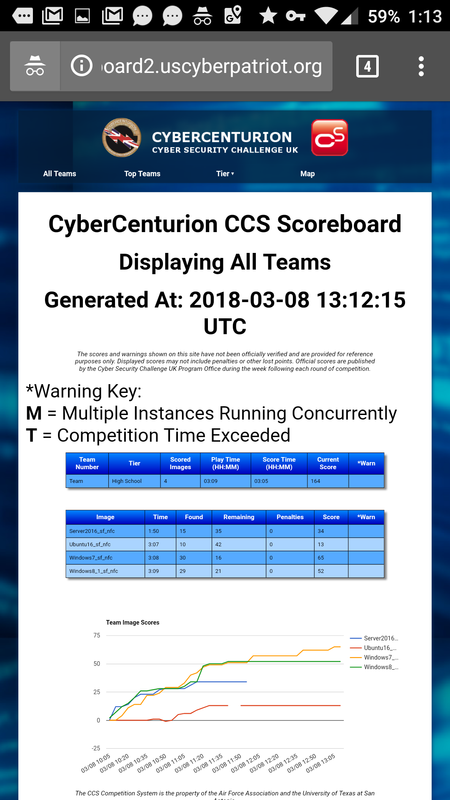 This is the last scoring report that I was able to capture, and while our team was able to gain points over a number of minutes, whenever they would be close to the team in first position, that team would make a large jump points wise. The last we knew, our team was 14 points behind first place, and only 8 points above third. This was going to be a close final result! I’m going to be honest with you here again. Once the scoreboard was turned off we were a lot more relaxed. We knew there was nothing that we could do, and it was all up to the students in the competition room. Although it was only a 20 minute wait for them to finish, it did seem to take quite a while. The countdown for the last few seconds took place, then all teams stopped. We headed over to our students who were adding up the number of points they had scored (their idea) which came to a total of 288. Everyone was relieved that it was over, and knew that it was going to be a close final result. The students were saying some of the issues that they had managed to figure out in the afternoon session (some that had been annoying them since the morning session), and the student with the new Ubuntu image said that they had thought it was similar (if not identical) to one from an earlier round. They also said that at the very last minute they had figured out one of the forensic questions that involved a regular expression, gaining them 6 points. It was now a case of waiting around to see who the winners would be. During the waiting time, our team (along with a few others) were asked if they would like to give interviews about how they had found the day, and about the competition in general. We got the chance to go onto the roof terrace of the IET, which offered fantastic views over some of the main sights of London. It took around 45 minutes for the people running the competition to finalise the scores. During this time everyone was nervous and talking about how they thought the competition had gone. Our students were trying to suss out how well they’d done in comparison to the other two teams that were nearby. There were two sets of trophies to give out. 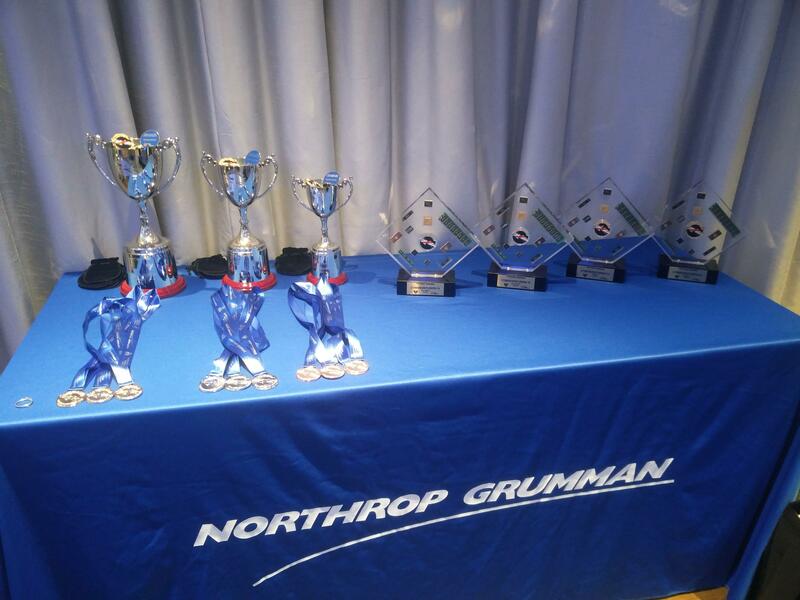 The diamond shaped ones were for the top team of each group type (boys, girls, mixed, cadets) to get through to the final, and the cups were for the top three teams of the final. Our team then sat down, we applauded the other teams that were the top of their respective stream, then were told the VIP hadn’t yet arrived to give out the trophies for the respective places. 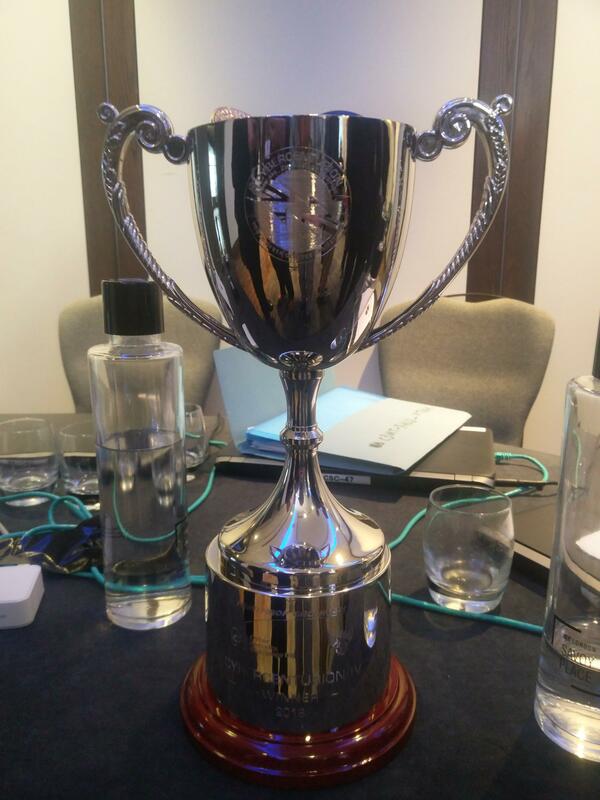 So, to pass the time we had a look at the award the team had just won. While the other teams that had won their awards were celebrating with each other, our team was trying to work out the models of the components (well, which self-respecting group of computing students wouldn’t?). Most of the parts didn’t really have any majorly identifying model numbers on them, the processor above the logo in the middle is an Intel 80186. Around 4 o’clock the VIP arrived. It was Oliver Dowden, who is the Minister for Implementation (yes, we didn’t know what that meant either). He gave a brief speech, then it was time for the winners of the final to be announced. To keep the suspense going, the names of the winning teams were inside envelopes. The third place team was announced first. The room went quiet, and “Vault 7 from Frome College” was declared. They went up to collect their trophy and medals, and everyone applauded. Well, that meant that our team had manged to stay out of third place. Second place was to be announced next. At this point in time, we all became nervous, as we hoped that our team had managed to stay in second place. There was a bit of a dramatic pause as the team name was removed from the envelope, and… “Saved by [the] Bell from St Paul’s School, Barnes” was declared (one of these teams won the previous year). A gasp went around our team, as we were sure that we would have been announced. The second place team also went to collect their trophy, and then it was announced there would be a small delay before the overall winners were announced. Our team was in quite a surprised state at the moment. Had they come in first place, or had something dramatic happened and they’d been pushed into fourth? The suspense was intense as we weren’t sure what was going to happen. The team went up to collect their medals and the trophy, while I went off to take photos (in case you’re wondering what I’m miming in the 3 seconds that I’m in the video for (I also appear in the video as voice only, with a “Whoo!” that happens as the video fades out)). Additionally, as a prize for coming first, our team had won an all expenses paid trip to Virginia in the United States of America! Prizes for other years have been: a valve from Colossus; a replica of letter notifying that the Lorenz cipher had been broken; Raspberry Pi’s to help STEM in school, so this was a pretty fantastic one. The team came back to the table and we all got a chance to look at the trophy and to celebrate. We couldn’t actually believe we had won, and were the best team in the UK (2018) (that just sounds amazing to say). 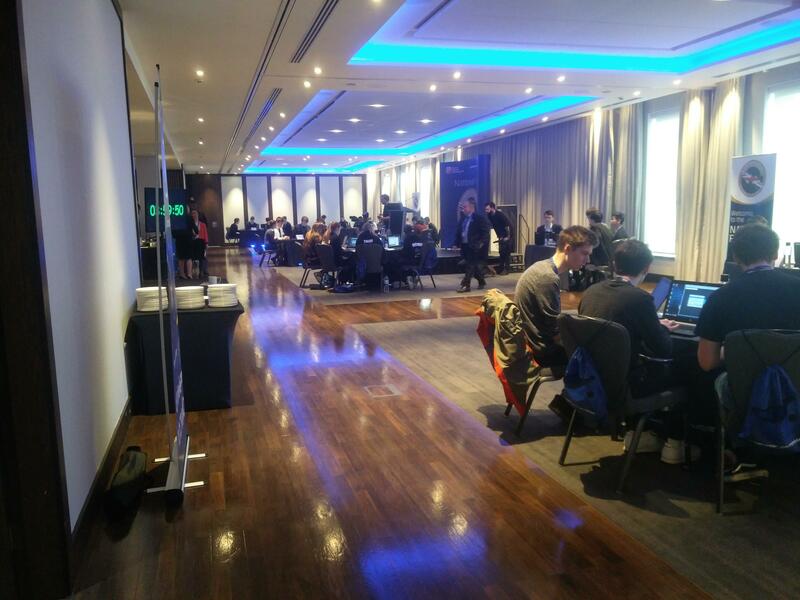 The student were involved in a number of additional interviews from the people running the competition and various media outlets (even I was somehow dragged into one!). While this was going on, a number of the staff members running the competition came over to ask us how we were feeling. Everyone was saying how elated and pleased they were for the students. Those staff members were also saying how well the students had actually worked together as a team. Most of the teams there were of a similar age range, whereas ours were from Year 10 (15 – 16) through to Sixth Form (17 – 18). Additionally, our team was commended on just coming along and getting on with the competition at hand without much fanfare or “hey, look at us“, and for showing determination and perseverance to get into the final round three times. It was then that we found out how close it had actually been between the top teams. When the “2 minutes remaining” announcement was made, our team had just tied with the team that were in first place. With 1 minute remaining, they had just pipped the other team by a few points (around 4 seemed to be the consensus). We couldn’t believe how close it actually was, but it goes to show what a fantastic amount of effort the students put in to gain so many points from the last time we had seen the scoreboard. We now had few problems. 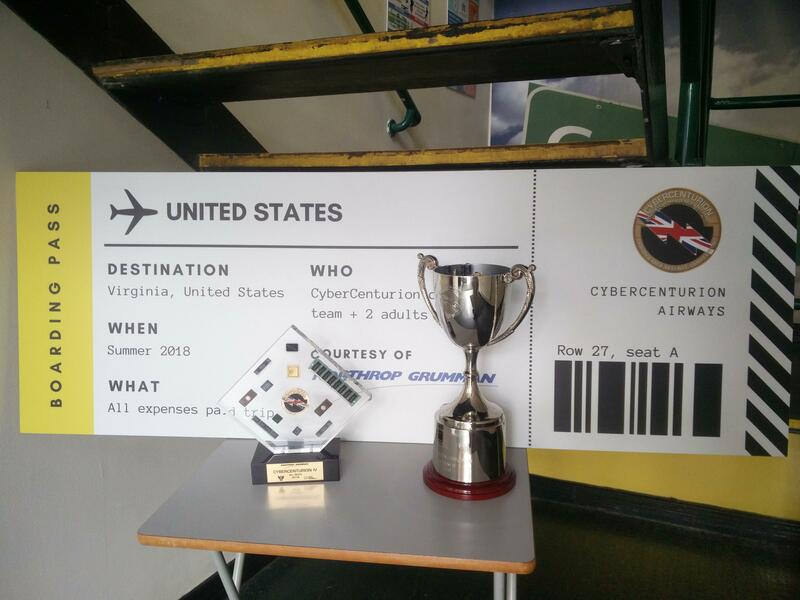 There were two trophies that needed to be taken back on the train, as well as a big airplane aeroplane ticket (sorry, I came over all American there). Although we had though it would be nice to win the competition, we hadn’t actually prepared ourselves beforehand if we did manage to win. Luckily one of the students had a few spare Aldi carrier bags with them, so the trophies had an undignified journey back. The other problem we had was that the train was due to leave at 5:15, we had a half hour walk back to the station, and due to the interviews taking quite a while it was now 20 to 5. We collected our belongings from the cloakroom, and had chance to speak to some of the students from Gibraltar before leaving. One of their teams had won the first year we took part in, and it’s been a running theme in our team to know if the Gibraltans are going to be in the final again. The walk back to the station was an interesting one. As the ticket was the same height as one of our students, it gained a lot of attention from passers by. It being prime rush-hour didn’t help with this either. Nearly every person that we walked past tilted their heads to read what was written, and a few asked about it when we stopped at some of the many traffic lights. We managed to get to the station with a few minutes to spare, and also were able to get some seats together (with tables!) on the train too. Everyone was in really high spirits and talked about how the competition went for most of the journey. When we returned to school the next day, it did seem kind of… boring – everyone was still on a high from the day before. We visited the headmasters office to spread the good news (he claimed that it was his text the day before that did it – along the lines of “win, or don’t bother coming back”). A number of other staff also heard about how well we did and congratulated us as we went around school (and said how jealous they were of us going to the United States). During the computing lessons, the teacher was informing their classes about what had happened over the last few days, with the intention of inspiring more students to join in and get involved with cyber security. I was talking to the teacher not long after we had won the overall competition (during the time when it was partially surreal to think we were the champions). We were thinking about how much the students had progressed over the three years that we had taken part in the competition. When we looked back at how this all started for us, it was a parent who mentioned about it one parents evening, and the following day the teacher asked one of the students if they wanted to “give it a go“. The response was “yeah, why not“. Very humble beginnings indeed. Although we had always managed to get some teams into the final, this group of students seemed to form the perfect team. They were all great in their individual roles of the team, but together they were fantastic. I would personally like to thank each and every one of the students who made up this team (in no particular order): HS, MD, EC, AD, AH – you are all amazing (and know who you are). As weird as it may sound, we don’t have a trophy cabinet. So, to prevent damage to the first trophy we achieved by it being left unattended in the classroom, it’s currently on display in my office. I’ve also had numerous jokes from the team for me not to crack it open to use the parts inside to upgrade(!) the school computers. If you’re also wondering about the team name, it’s an ongoing theme that the team has had. 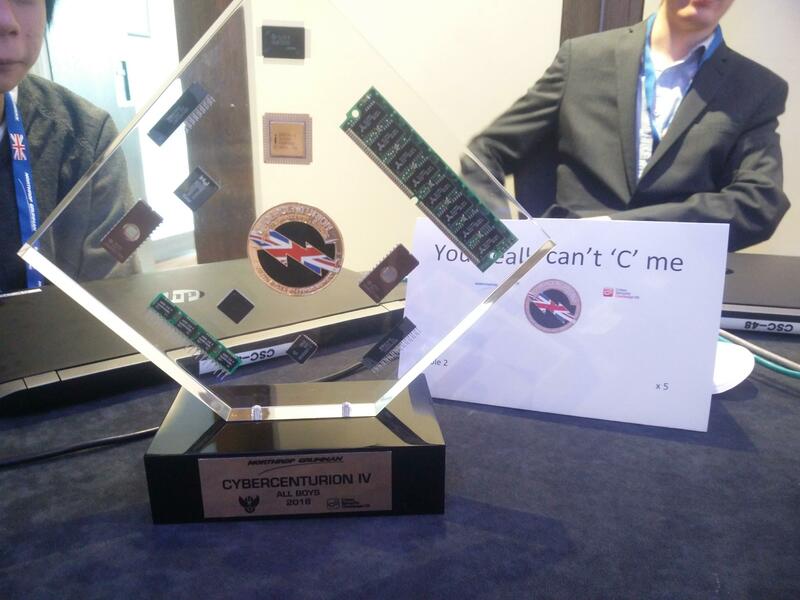 The first year was “You can’t ‘C’ me” (a very clever pun on the ‘C’ programming language), then the second year it’d changed to “You still can’t ‘C’ me“, and clearly the winning combination for the team name was “You really can’t ‘C’ me“. On a slightly different note, on the 7th March it was my 7 year anniversary at my current workplace, so this was a very nice “present” to be part of. I’ve always seen various staff members going off for trips at the end of the academic year (theme parks mainly) and been partially jealous, but as my role doesn’t normally involve teaching students, it’s quite understandable that I wouldn’t be considered. However, since I’ve had the headteacher say that I can go abroad, it’s a long overdue reward. If you do have a pressing need to see more photos from the event, click on the link that you’ve just passed. Posted in Events, Software, Trips, Work Life. Tagged CyberCenturion, London, Security.